The world had been cooling since the 1940s and by the 1970s the consensus of climate scientists was that we were about to enter another “ice age” or at least to return to the cold of the “little ice age” (the period from about 1300 to 1870). Dire predictions appeared in the popular press; see here for a sampling of story headlines. There were many scientific papers supporting future cooling also. People trying to justify the current human-caused global warming scam by claiming a supporting consensus of scientists want to get rid of that previous consensus which said global cooling was the existential danger. At the end of the article, Richard gives links to and abstracts of many papers from the 1960s, 1970s, and 1980s which predict global cooling to come. Not only did Connolley — a co-founder (along with Michael Mann and Gavin Schmidt) of the realclimate.com blog — successfully remove (or rewrite) the history of the 1970s global cooling scare from the Wikipedia record, he also erased (or rewrote) references to the Medieval Warm Period and Little Ice Age so as to help create the impression that the paleoclimate is shaped like Mann’s hockey stick graph, with unprecedented and dangerous 20th/21st century warmth. A 2009 investigative report from UK’s Telegraph detailed the extent of dictatorial-like powers Connolley possessed at Wikipedia, allowing him to remove inconvenient scientific information that didn’t conform to his point of view. “All told, Connolley created or rewrote 5,428 unique Wikipedia articles. Richard also discusses an attempt to say that there really wasn’t a cooling consensus at all so we should now believe the “real” consensus of human-caused warming. Ironically, some scientists are again predicting a cooling phase because solar cycles (sunspot numbers) are weakening which leads to more cloud cover and cooling. The past is getting cooler – government data manipulation designed to make the present look warmer in relation to the past. Posted in Climate change and tagged consensus, cooling, global warming on September 27, 2016 by wryheat2. Twentieth Century warming was nothing unusual. Climate is cyclic, and there are cycles within cycles. The graph below, based on reconstruction from the geologic record, shows that there have been several cycles of warming and cooling since the end of the last glacial epoch. 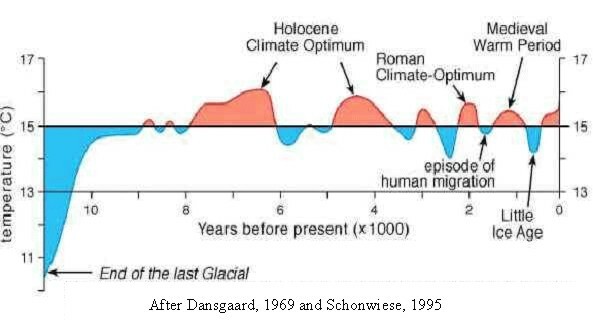 The temperature during the Holocene Climate Optimum was 3ºF to 10ºF warmer than today in many areas. Evidence for these cycles is found in the ice cores from Greenland and Antarctica, in fossil pollen records, in cores of sediments taken beneath lakes and the ocean, in the distribution of glacial deposits, in the analysis of stalagmites in caves, and in the historic record. These records also show that the cycles were global events. It is still unclear why these cycles occur at the intervals they do. Some researchers say it’s a combination of solar cycles which periodically reinforce each other both positively and negatively. For most of the history of this planet, atmospheric carbon dioxide levels were more than 10 times the current level. For most of the last 250 million years carbon dioxide levels were more than three times the current level. Climate alarmist claims that our carbon dioxide emissions could trigger runaway global warming is pure nonsense. It if could happen, it would have happened already. Run-away warming cannot happen on this planet because Earth is a water world. Warming increases evaporation. Water vapor, and its latent heat, is carried aloft by convection. Heat is lost to space when the water vapor condenses. The condensation also produces clouds which reflect incoming solar radiation. That is Earth’s negative feedback mechanism to prevent run-away warming. Dansgaard, W. , et al., 1969, One Thousand Centuries of Climatic Record from Camp Century on the Greenland Ice Sheet, Science 17 Vol. 166. no. 3903. Friis-Christensen, E. And Lassen, K., 1999, Length of Solar Cycle: An Indicator of Solar Activity Closely Associated with Climate, Science 254. Hu, F.S. et al., 2003, cyclic Variation and Solar Forcing of Holocene Climate in the Alaskan Subarctic, Science 301. Niggerman, S., et al., 2003, A Paleoclimate Record of the last 17,000 Years in Stalagmits from the B7 Cave, Sauerland, Germany, Quaternary Science Reviews 22. Pisias, N.G. et al., 1973, Spectral analysis of Late Pleistocene-Holocene Sediments, Quaternary Research, March 1973. Schönwiese, Christian, 1995, Klimaänderungenaten, Analysen, Prognosen.-224 S.ISBN: 978-3-540-59096-5. Viau, A.E. et al., 2002, Widespread Evidence of 1,500-yr Climate Variability in North America during the Past 14,000 Years, Geology 30.